GISCafe: How quickly can Geofeedia make something useful out of the data it picks up? R.J. Talyor: Immediately. Customers are able to discover, analyze and take action on posts since Geofeedia surfaces this content in about 15 seconds after it’s posted. 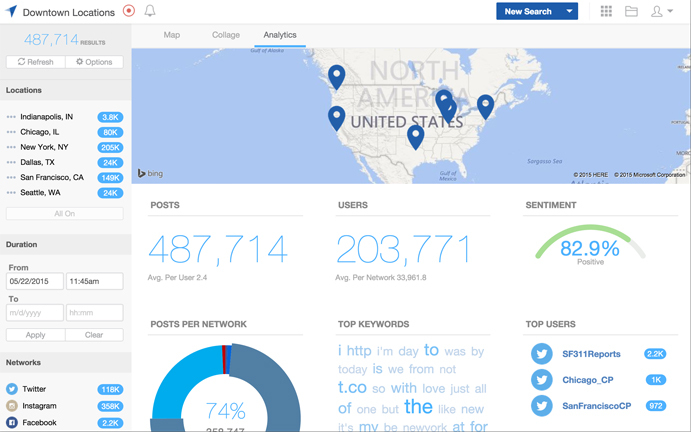 GISCafe Voice: When you say it is a “social listening tool,” what does that mean exactly? R.J. Talyor: Geofeedia enables organizations to discover social media conversations within locations that matter. GISCafe Voice: Where does the data come from? R.J. Talyor: Geofeedia aggregates publicly-available social data from the top social networks (including Facebook, Twitter, Instagram, YouTube, etc. ), and includes text, images and videos shared. GISCafe Voice: What do customers do with the data that they glean from the Geofeedia tool? R.J. Talyor: Geofeedia customers range from news organizations (e.g. CNN, BBC, Mashable) looking to discover breaking news to public safety organizations gaining situational awareness in a crisis to marketers wanting to better engage with their customers. GISCafe Voice: What will customers be able to do with the updated tool that they could not do before? 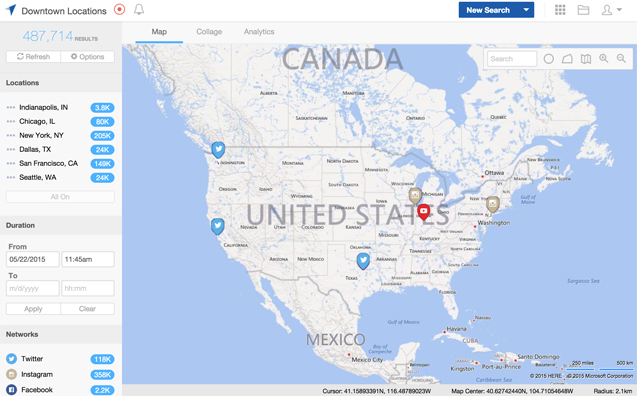 R.J. Talyor: Geofeedia customers have access to ten new core capabilities including the ability to aggregate data across multiple locations, track sentiment in one or more locations, and access this data on-the-go with the mobile app. GISCafe Voice: Where does the data usually go after it has been compiled – and how is it sorted, for use? R.J.Talyor: Geofeedia data is archived for customers within the cloud for additional analysis. This entry was posted on Wednesday, June 24th, 2015 at 7:22 pm. You can follow any responses to this entry through the RSS 2.0 feed. You can leave a response, or trackback from your own site. Josh,I suppose we’re off topic now. The puorpse of my post was only to highlight the presentation mode feature.However, I may be inspired enough to take up these other topics in a future post.Best,KevinP.S., I use explorer.arcgis.com for local Clean the Bay Day organization and collaboration. I just don’t have a web site or blog around it.